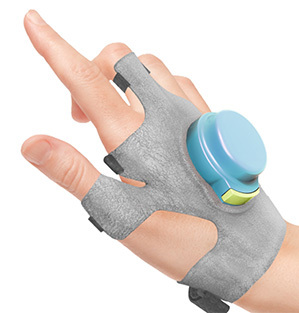 The GyroGlove is designed for people with the tremulous symptoms of Parkinson’s, a disease that affects one in 500 people; it holds out hope for an otherwise hopeless problem. Faii Ong was assigned to care for a 103-year-old patient who suffered from Parkinson’s, the progressive neurological condition that affects a person’s ease of movement. After watching her struggle to eat a bowl of soup, Ong asked another nurse what more could be done to help the woman. “There’s nothing,” he was grimly told. Together with a number of other students from Imperial College London, Ong worked in the university’s prototyping laboratory to run numerous tests. An early prototype of a device, called GyroGlove, proved his instinct correct. Patients report that wearing the GyroGlove, which Ong believes to be the first wearable treatment solution for hand tremors, is like plunging your hand into thick syrup, where movement is free but simultaneously slowed. In benchtop tests, the team found the glove reduces tremors by up to 90 percent.